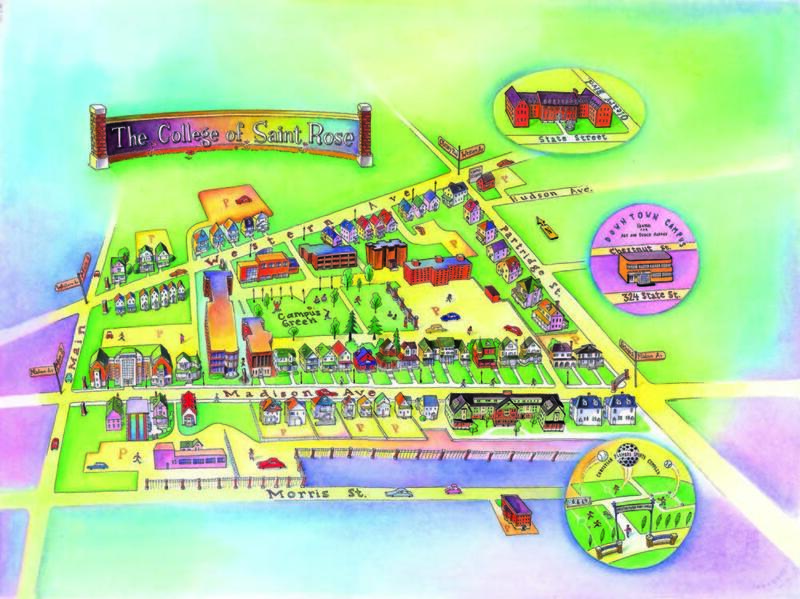 Over the last few decades, Albany's College of St. Rose has expanded both its campus and its educational offerings. But there've been a few bumps in the road more recently. The College of St. Rose is experiencing what some might call growing pains - Labor problems with adjunct professors, staff cutbacks, cuts to benefit packages and a drop-off in admissions. A $9 million funding shortfall. Students wondering about the future of the college. The resignation of the vice-president for academic affairs. Adjunct Professor of Anthropology at the College of Saint Rose Bradley Russell says he and his colleagues are the lowest paid adjuncts in the region. "The adjunct faculty is now in our ninth month of negotiation of our first contract with the college. The administration's negotiating team has refused to provide us important details about the school's financial situation on which we can base our economic proposals. They've declined to meet with us more than just four hours a month to hammer out the contract despite repeated requests for more negotiation time. While some progress has been made, we are far short of the mark the union considers reasonable this far in the talks. We still have no agreements on critical issues, such as longer term contracts and a reasonable living wage." As adjuncts fight for higher salaries, students and their families battle with the student loan industry and try to avoid getting entangled in mounting student debt. Laura Anglin, president of the Commission on Independent Colleges and Universities, says the Great Recession has made families to more conscientiously evaluate colleges in a quest for a quality education. And in turn, the colleges have been reviewing, analyzing, evaluating themselves. "That's what St. Rose is doing now. They're really doing an evaluation to try to figure out what is the best way they can give value in the education that they're providing but also that it'll be best for students who go there. The northeast also has a little bit of a challenge that other parts of the country don't have, in that we have changing demographics. In New York State, we're in a period of declining traditional students graduating from high school. What that means is we are seeing a smaller number of kids graduating from high school, therefore, there's a smaller number of kids or traditional students in New York going to college." Lisa Haley Thomson is vice president for strategic communications and spokesperson for St. Rose. She says that the college remains dedicated to serving the needs of its students both now and in the future. She proclaims 2015 "a great year" for St. Rose, and expects things will only improve. "Like many many institutions across the country, the College of St. Rose is not immune to demographic shifts and economic challenges. And with that in mind, we had to have a conversation and had to make some decisions. And it's happening at institutions across the country." Thomson adds the college and its board of trustees "has a growth strategy going forward." When asked to elaborate, said the strategy includes "investing in areas of growth and planning for long-term health and stability." College students and community members throughout the country are coming together to organize and support relief efforts following Saturday's Nepal earthquake. The earthquake has claimed at least 5,500 lives. WAMC’s Hudson Valley Bureau Chief Allison Dunne looks at a few of the efforts from Nepali students at colleges in New York. College is one of the biggest expenses facing families across New York and the nation. Politicians and educators are actively working to mitigate the financial impact of the high cost of tuition and resulting student debt. The cost of a college education has been spiraling upward for years, to the point where some call it “a national crisis” — specifically, a debt crisis, expected to have, in the long-run, a negative effect on the U.S. economy.